We present a case of an isolated open total talar dislocation and discuss its surgical management, potential complications, and functional outcome. A 33-year-old man injured his right and left ankles in a workplace accident. He was occupied to remove a heavy (about 300 pounds) steel security door which fell on him. He will retain it, but he did not succeed in doing that. In the heat of the moment, he sustained in all probability a movement of extreme supination and plantar flexion of his right ankle. He received the door on the right side of his ribcage and remained trapped. His colleagues immediately assisted him removing the door. When the first-aid workers arrived, the patient was conscious and hemodynamically stable. They provided him with medical care and brought him to the emergency department of our hospital. At admission (90 min after the accident), he was in moderate distress due to pain and well oriented. Vital signs were constant. To facilitate the initial management, he was intubated. Examination of the right foot revealed a rather clean wound on the anterolateral side of the ankle through which the talar body was thrown out [Figure 1]. Further, there was clearly a fracture dislocation of the left ankle which was immediately reduced and immobilized. Neither vascular impairment nor sensory loss was evident. The patient was administered 1.5 g of cefuroxim (Zinacef ®) intravenously and a tetanus toxoid booster. The talus was wrapped in antiseptic standard solution-soaked gauze. Preoperative computed tomography (CT) scan displayed a total dislocation of the talus with a small inferolateral osteochondral fragment, a reduced “equivalent trimalleolar” fracture of the left ankle and fractures of the anterior arch of the 5th, 6th, and 7th ribs. The patient was then brought to the operating room. The wound was copiously irrigated with pulsed lavage using 9 L of sterile normal saline followed by 10% povidone-iodine. The single strand of soft tissue attached to the talar neck was preserved and the talus was reduced anatomically with the help of a threaded Steinmann pin previously inserted into the posterior calcaneal tuberosity. The anterolateral capsular ligamentar apparatus was repaired as a possible attempt and the wound was closed by primary intention. The ankle was then stabilized by means of an external fixator placed in a delta configuration. The left lateral malleolus was as well open reduced and fixed by a plate and the ankle was placed in a walker boot (VACOped ®). Intravenous antibiotics (amoxicillin-acid clavulanic 2.2 g every 6 h) were continued for a total of 5 days. The external fixator was maintained for 8 weeks. Weightbearing was forbidden for 2 months. At 8 weeks, postoperative radiographs showed the absence of the Hawkins' sign conveying a high risk of avascular necrosis (AVN) of the talus. The external fixator was removed at 8 weeks postoperatively. Partial weightbearing was then allowed under protection of an ankle brace for further 4 weeks on the right limb and total weightbearing was allowed on the left limb together with a range of motion exercises of both the ankles and muscular reinforcement of the legs. 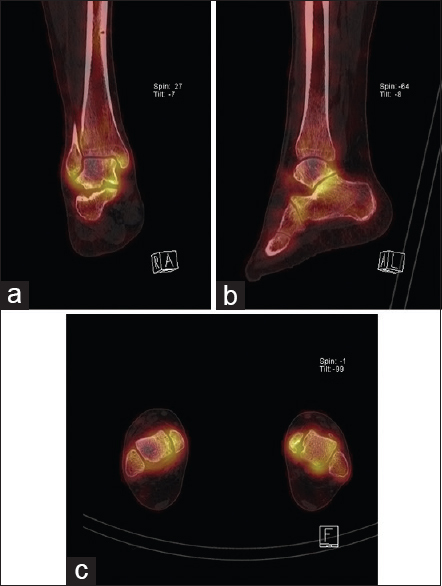 At the 6-month follow-up, an arthro-magnetic resonance (MR) imaging showed posttraumatic sequelae of the right ankle, especially on the lateral part of the talus (AVN) with signs of revascularization [Figure 2]. One year postoperatively, the patient was evaluated both radiographically and functionally. He reported moderate daily pain with weightbearing but painless motion of his right ankle. Physical examination showed a mild restriction of the sagittal motion of the right ankle compared with the left ankle. The patient also displayed a moderate restriction of subtalar joint motion. A Single Photon Emission Computed Tomography (SPECT) scan confirmed a delimited zone of AVN of the talus on its superolateral part [Figure 3]. The American Orthopaedic Foot and Ankle Society (AOFAS) Ankle-Hindfoot Scale (AHS) score and the Manchester-Oxford Foot Questionnaire-Index (MOXFQ-Index) score were, respectively, 77/100 and 40/0. At the last follow-up (18 months postoperatively), radiographs demonstrated a mild narrowing of the tibiotalar joint space [Figure 4]. The AOFAS AHS score and the MOXFQ-Index score were then, respectively, 74/100 and 45/0. Talar dislocation is open and anterolateral in more than 50% of cases.,,, No specific mechanism of trauma leads distinctly to ankle, subtalar, or total talus dislocation. Leitner  defined a 3-stage mechanism of dislocation: talar extrusion can be regarded as the end point of a combined movement of extreme subtalar supination and tibiotalar plantar flexion. A high-energy trauma is mostly responsible. In our case, the mechanism was in all probability a movement of extreme supination and plantar flexion on the right ankle when the patient was trying to hold a heavy steel security door which was falling on him. Open talar dislocations are frequently complicated by soft-tissue infection. The infection rate ranges from 11.5% to 38% of cases , compared with 88.9% initially reported by Detenbeck and Kelly. Over the years, infection risk has been diminished through improvement of staged procedures for wound care and soft-tissue management and adapted antibiotherapy. AVN of the talus is a feared complication. The blood supply to the talus includes the artery of the tarsal canal, branch of the posterior tibial artery, the deltoid branches of the posterior tibial artery, and the sinus tarsi artery formed by the anterior tibial artery and perforating peroneal artery. There is also a system of interosseous anastomoses which are complete in approximately 60% of cases. The incidence of AVN is due to the vulnerable nature of this blood supply  and depends on the loss of soft-tissue attachments., In the early postoperative period, the development of AVN is not easy to predict. MR imaging remains the most specific and sensitive examination to recognize early development of AVN; it can be seen from 6 months to 2 years postinjury albeit posttraumatic arthritis may develop after more than 10 years. The Hawkins' sign is the only early predictive marker of revascularization that can be seen on standard radiography. It is defined as subchondral radiolucency in the talar dome, which is visible 6–8 weeks postinjury. If a full or partial positive Hawkins' sign is observed, it is improbable that AVN will develop subsequently. In our case, we cannot observe this sign on standard radiography. The arthro-MR of the right ankle showed a delimited zone of talar AVN 6 months postoperatively with signs of revascularization. At 1 year after the operation, a SPECT/scan confirmed the presence of an AVN of the talar dome on its superolateral part. Hiraizumi et al. showed that the risk of AVN was highest in cases in which no soft tissues remained attached to the talus. Posttraumatic osteoarthritis is not a rare complication of these injuries.,,, It is reasonable to expect at least some degree of subtalar or tibiotalar arthritis. Clinically significant osteoarthritis in patients with isolated talar dislocation is lower (10%) than the incidence in the overall talar dislocation (16%). The possible reason of predisposing to this complication is the forces applied during the injury to talus cartilage. In our case, the radiographs at the last follow-up (18 months postoperatively) showed mild tibiotalar arthritis. In conclusion, open total talar dislocation is a terrible injury and its treatment is demanding. Early reimplantation of the talus appears to be a worthwhile procedure to avoid talectomy and tibio-calcaneal arthrodesis initially. The latter gives rise to severe functional loss and should be regarded as a secondary choice in case of talar salvage failure. All patients should be enlightened of the unpredictable long-term prognosis and the feasibility of further reconstructive procedures. Van Opstal N, Vandeputte G. Traumatic talus extrusion: Case reports and literature review. Acta Orthop Belg 2009;75:699-704. Leitner B. The mechanism of total dislocation of the talus. J Bone Joint Surg Am 1955;37-A:89-95. Schuind F, Andrianne Y, Burny F, Donkerwolcke M, Saric O, Body J, et al. Fractures and dislocations of the astragalus. Review of 359 cases. Acta Orthop Belg 1983;49:652-89. Montoli C, De Pietri M, Barbieri S, D'Angelo F. Total extrusion of the talus: A case report. J Foot Ankle Surg 2004;43:321-6. Hiraizumi Y, Hara T, Takahashi M, Mayehiyo S. Open total dislocation of the talus with extrusion (missing talus): Report of two cases. Foot Ankle 1992;13:473-7. Lee HS, Chung HW, Suh JS. Total talar extrusion without soft tissue attachments. Clin Orthop Surg 2014;6:236-41. Hidalgo Ovejero AM, Garcia Mata S, Heras Izaguirre J, Martinez Grande M. Posteromedial dislocation of the talus. A case report and review of the literature. Acta Orthop Belg 1991;57:63-7. Detenbeck LC, Kelly PJ. Total dislocation of the talus. J Bone Joint Surg Am 1969;51:283-8. Palomo-Traver JM, Cruz-Renovell E, Granell-Beltran V, Monzonís-García J. 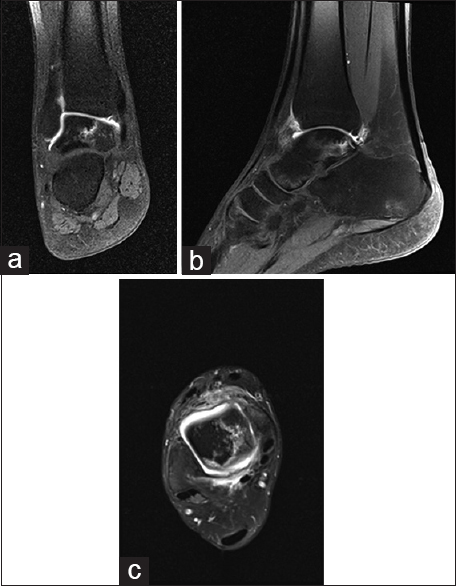 Open total talus dislocation: Case report and review of the literature. J Orthop Trauma 1997;11:45-9. Ramesh P, Avadhani A, Dheenadhayalan J, Rajasekaran S. Reimplantation of total talar extrusions. Injury Extra 2010;41:53-7. Karampinas PK, Kavroudakis E, Polyzois V, Vlamis J, Pneumaticos S. Open talar dislocations without associated fractures. Foot Ankle Surg 2014;20:100-4. Lesić AR, Zagorac SG, Bumbasirević MZ. Talar injuries – The orthopaedic challenge. Acta Chir Iugosl 2012;59:25-30. Gerken N, Yalamanchili R, Yalamanchili S, Penagaluru P, Md EM, Cox G, et al. Talar revascularization after a complete talar extrusion. J Orthop Trauma 2011;25:e107-10. Memisoglu K, Hürmeydan A. Total extrusion of the talus in an adolescent: A case report. J Am Podiatr Med Assoc 2009;99:431-4. Marsh JL, Saltzman CL, Iverson M, Shapiro DS. Major open injuries of the talus. J Orthop Trauma 1995;9:371-6. Gelberman RH, Mortensen WW. The arterial anatomy of the talus. Foot Ankle 1983;4:64-72. Mulfinger GL, Trueta J. The blood supply of the talus. J Bone Joint Surg Br 1970;52:160-7. Huang PJ, Fu YC, Tien YC, Lin GT, Lin SY, Cheng YM, et al. Open total talar dislocation – Report of two cases. Kaohsiung J Med Sci 2000;16:214-8. Breccia M, Peruzzi M, Cerbarano L, Galli M. Treatment and outcome of open dislocation of the ankle with complete talar extrusion: A case report. Foot (Edinb) 2014;24:89-93. Tezval M, Dumont C, Stürmer KM. 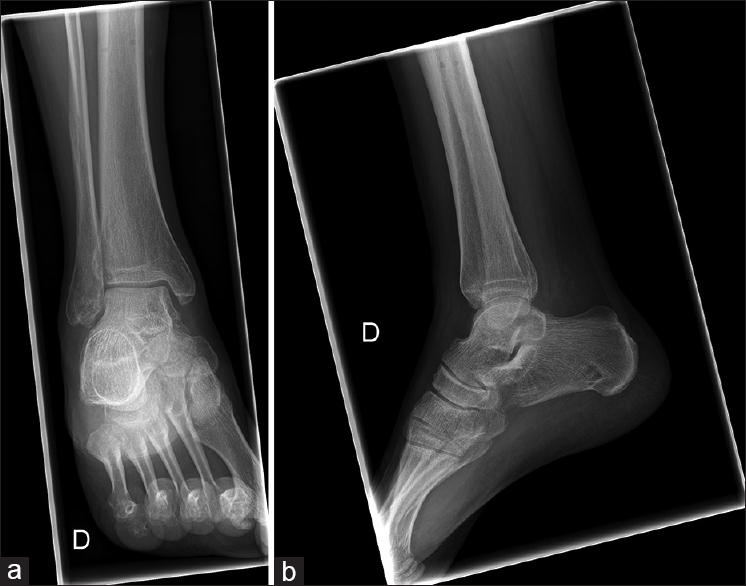 Prognostic reliability of the Hawkins sign in fractures of the talus. J Orthop Trauma 2007;21:538-43. Brewster NT, Maffulli N. Reimplantation of the totally extruded talus. J Orthop Trauma 1997;11:42-5. Gulan G, Sestan B, Jotanović Z, Madarević T, Mikacević M, Ravlić-Gulan J, et al. Open total talar dislocation with extrusion (missing talus). Coll Antropol 2009;33:669-72. Weston JT, Liu X, Wandtke ME, Liu J, Ebraheim NE. A systematic review of total dislocation of the talus. Orthop Surg 2015;7:97-101. Fleming J, Hurley KK. Total talar extrusion: A case report. J Foot Ankle Surg 2009;48:690.e19-23. Smith CS, Nork SE, Sangeorzan BJ. The extruded talus: Results of reimplantation. J Bone Joint Surg Am 2006;88:2418-24. Mohindra M, Gogna P, Thora A, Tiwari A, Singla R, Mahindra P, et al. Early reimplantation for open total talar extrusion. J Orthop Surg (Hong Kong) 2014;22:304-8. Schiffer G, Jubel A, Elsner A, Andermahr J. Complete talar dislocation without late osteonecrosis: Clinical case and anatomic study. J Foot Ankle Surg 2007;46:120-3. Assal M, Stern R. Total extrusion of the talus. A case report. J Bone Joint Surg Am 2004;86-A:2726-31. Wagner R, Blattert TR, Weckbach A. Talar dislocations. Injury 2004;35 Suppl 2:SB36-45. Taymaz A, Gunal I. Complete dislocation of the talus unaccompanied by fracture. J Foot Ankle Surg 2005;44:156-8.